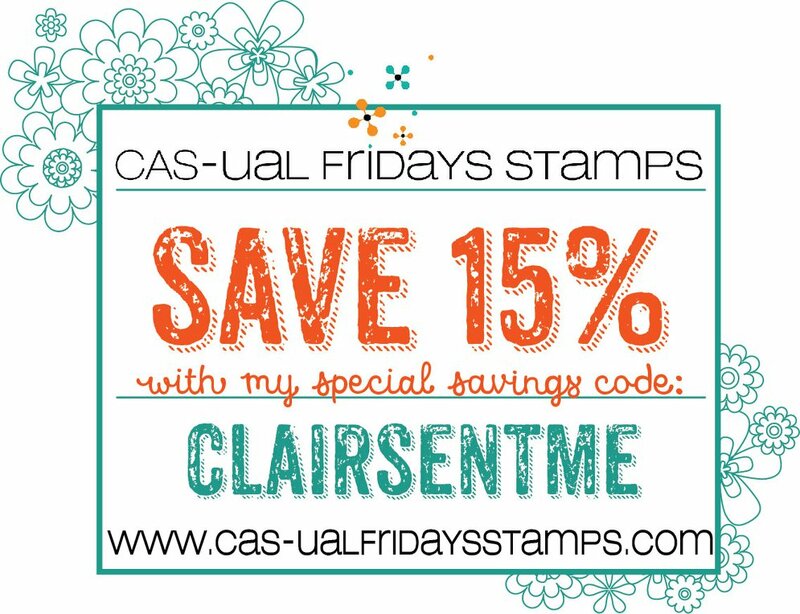 You'll remember that I recently discovered the Exchange Program over at Totally Tutorials. Dotty, who is the brainchild of the Exchange Program, puts suppliers of crafting materials in touch with crafters (like you and me) who receive free supplies in return for sharing their skills and creating tutorials. 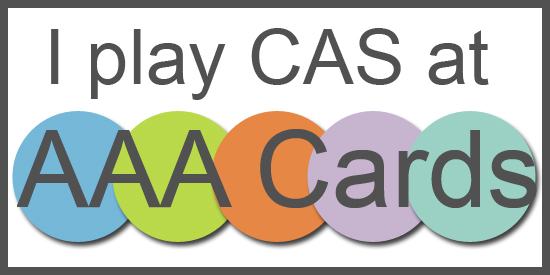 There are some wonderful suppliers taking part, so do go and have a look - you might get yourself some goodies to play with. I've been lucky enough to be asked to complete another tutorial by Jen at WeekendJewelry1 and - lucky me - Jen let me choose my own supplies. 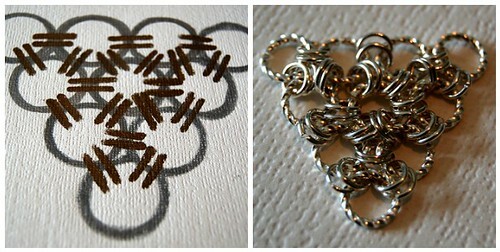 I've been dying to have a go at some chain maille for a while now, but couldn't seem to find any suitable jump rings. 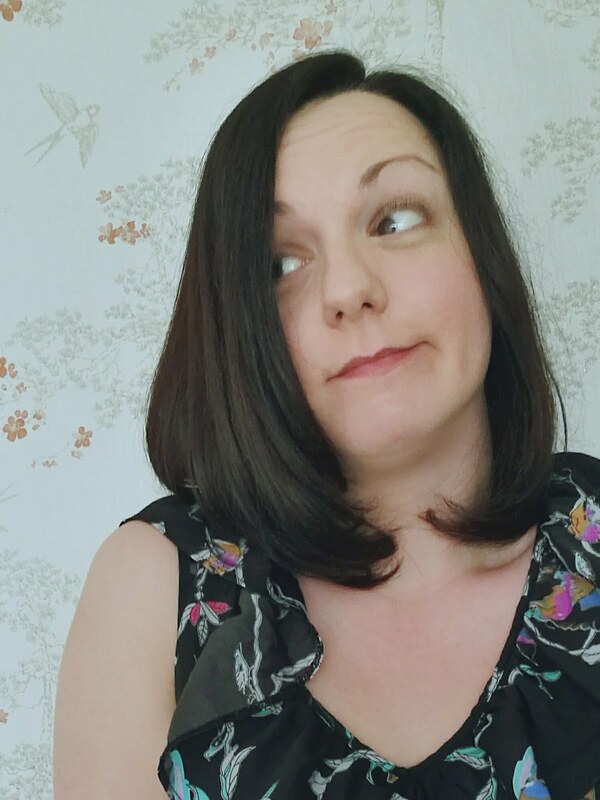 I wanted something just a little bit out of the ordinary and, when I saw these beautiful 8mm Twisted Wire Silver Jump Rings, I knew that I'd found the perfect supplies for the project I had in mind. Jen also has some chunkier 12mm Stainless Steel Flattened Rings which would make a nice Steampunk/Industrial piece and some super cute Pink Anodized Aluminium Jump Rings perfect for a kitsch look. 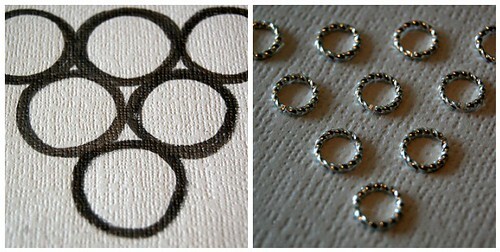 100 5mm Silver Plated Plain Jump Rings. You will need exactly 100, so if you're unsure, I would advise you to order more just in case you fudge a few. They also have a tendency to want to fly around the room!!! Necklace Clasp - I used a toggle clasp as I find these easiest to fasten. 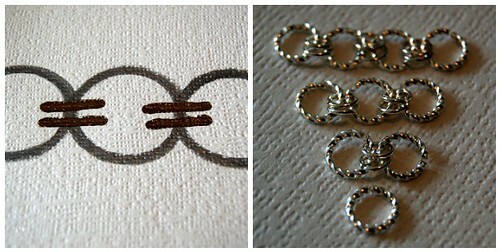 Then, line up the 8mm Twisted Wire Jump Rings into a basic design, as in the pictures below. 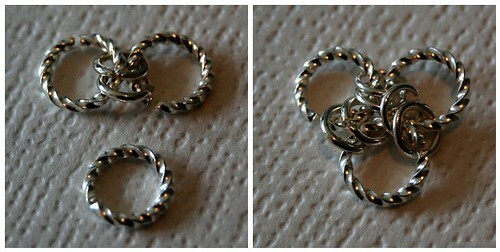 Join the rows of 8mm Twisted Wire Jump Rings, using two 5mm Jump Rings for each join. I chose to use six rows for this project - giving me a triangle of chain maille with six Twisted Wire Jump Rings on each edge, but you can add more rows if you like -just be sure you have enough of both types of jump rings. 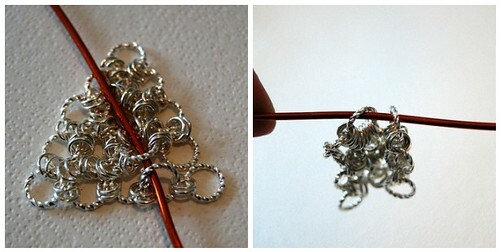 Take one length of the Cable Chain and, using a 5mm Jump Ring attach it to one part of the toggle clasp. Again, using a 5mm Jump Ring, attach the other end of the chain to a corner of the chain maille triangle. Using another 5mm Jump Ring attach the remaining length of Cable Chain to the other part of the toggle clasp. 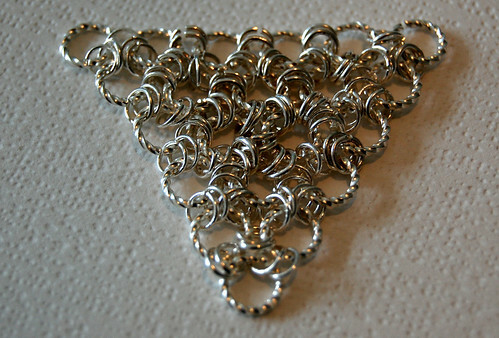 Then attach the other end of the chain to another corner of the chain maille triangle. 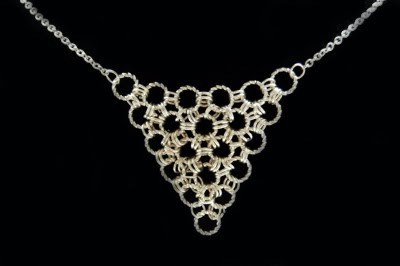 I think the design is quite elegant and has the potential to be worn with practically anything, but it could be customised by substituting the style of the jump rings; the size of the chain maille triangle; and the addition of extra components. In fact, Jen sent me some beautiful leaf charms as well and they'll be coming up in a simpler tutorial over the weekend. Thanks again to Jen at WeekendJewelry1 and Dotty from Totally Tutorials for giving me the chance to have a play around with these lovely supplies. 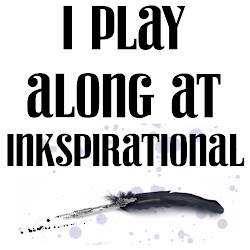 If you have a go, please leave me a link in the comments section below so that I can come and have a peek. really beautiful, and clever too! Love the drawing of the design as well. What a great tutorial - I'm addicted to the Exchange Program!!! Thank you for all of the kind comments ladies - they're always appreciated! An amazingly well-organized and easy-to-follow tute-and the helpful hint re the straw is priceless! 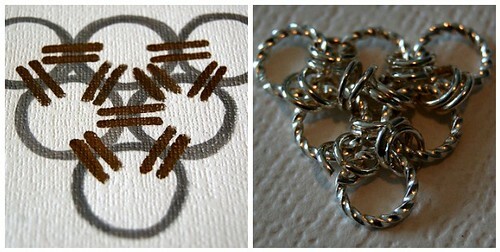 I have always wanted to dip into chainmaille and you have given me the impetus to check it out-thanks! That is a very beautiful necklace, i love it! Nicely done! Okay to feature and link to this tutorial in a future post so others can come visit? Thanks!